Few days ago, i wrote an article on 3 easy steps to get rid of unwanted ugly fat easily. Few days after that, i received an email from a reader asking exactly what types of food causes Belly fat. Actually, i covered those types of food in one of my Weight Loss 16 page reports that you can download for free at this link here. If you are yet to download your own copy, then go and do so right away. However, in today’s short article, I am going to share 2 more foods that actually causes belly fat. Now, I am sure i have explained that there are two types of fat. I mentioned that they are visceral fat and subcutaneous fat. If the above confuses you, then you should read my previous article where i dealt with this subject. Visceral fat, is the one that is also referred to as abdominal fat too. 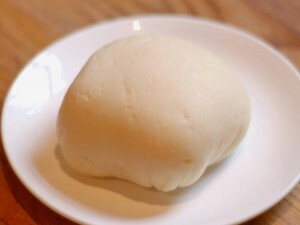 Now, I am going to talk about 2 Nigerian foods that actually causes it. Are you ready for this, because its going to shock you and you will might even disagree with me? Ok, if you are ready, let’s get going….. Yes, we all love Chicken, infact, our rice meal is incomplete without it. As a matter of fact, Nigerians are argueably the highest consumer of chicken in the whole ofAfrica. But let me tell you, Fried Chicken will make you fat. 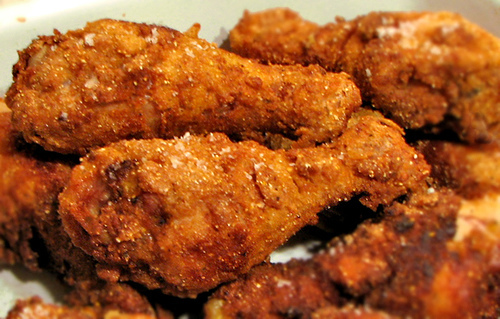 Just one fried chicken thigh itself has nearly 400 calories and 22 grams of fat. Now, imagine if you eat two of those chicken thighs….that is 800 Calories on its own. Not only is it fattening, the oil that is used to fry it is very high in saturated fat. This is bad for your body because of the high cholesterol level. A good alternative – Grill your chicken and remove the skin instead, this is a more healthier option. This food is common among the Yoruba’s and Ibo people. These two tribes of people consume a lot of this EXTREMELY starchy food. Too much of starch makes you fat, this is because its very high in carbohydrate which the body stores in form of fat. Do you know that a wrap of Akpu alone on its own contains round about 207 calories. So there you go……remember, i said earlier on that you might not agree with me completely with the above, because they are common Nigerian foods that we most times can’t do without. However, if you want a flat belly….do everything you can to stay away from these two food above. Eat healthier options. If you absolutely have to eat them, do small portions and eat it at least 4-5 hours before going to bed. I hope you have learnt something from today’s article. Make sure you leave comments in the comment section below to let us know what you think. And…share this article with other people too. NOTE – We are working on the weight loss challenge program and it will launch very soon. If you are interested, go and sign up at www.naijaweightloss.com to be able to get the details when we launch this program.